I love making bread. It is such a cozy, comfy thing to do. I don't know exactly when I started making bread. I remember my mom making bread and I learned at her elbow. I took lots of foods classes throughout my high school years and bread-making was a part of those classes. When our kids were little and I was able to be a stay-at-home mom, I baked bread every week. We lived in the Rocky Mountains, miles from the nearest town and so running to the store for a loaf of bread was not an option, especially in the winter months. I made fifteen loaves of bread a week. The great thing about bread is it's very forgiving. I have lots of bread recipes and I have used a few now and then. However, I like to just toss ingredients into a big bowl, mix it up and knead it out and rise it up! Frustrations get worked out in the kneading process, and in the end, the house smells amazing!! I baked bread yesterday (see photos) and this is how I did it. I poured three cups of hot water into my biggest metal bowl and mixed in 1/4 cup of sugar and about 4 1/2 tsp of yeast (That is two of those little envelopes). I let that sit while I got my bread pans ready. I just sprayed them with cooking spray. Then I added 2 eggs and a 1/2 cup of cooking oil. I used my hand mixer to beat it all together and then I started adding the flour until it was too hard to mix with the beaters. I mixed the rest of the flour in using my hands and when the dough pulled away from the sides of the bowl, I turned it out onto a floured surface and kneaded it for about 8 to 10 minutes. I sprayed one of my large vintage pyrex bowls with the cooking spray and put the dough in it, turning to coat with the oil. I put a clean tea towel over top and popped it into the oven with the light on and closed the door. This is a great place to set dough to rise. The heat from the light-bulb is enough to make that happen. It takes about an hour to an hour and fifteen minutes for the dough to double in size. Remove from oven, punch it down, shape into loaves and place in prepared pans. Set the pans back in the oven and cover with the towel until dough is doubled in size, about an hour. Remove from oven and set, still covered with towel, on the counter, while the oven is preheating at 375 degrees. When oven is ready, place pans on the rack and bake for 30 minutes. Once they are baked, remove from oven and pans onto a wire rack to cool. 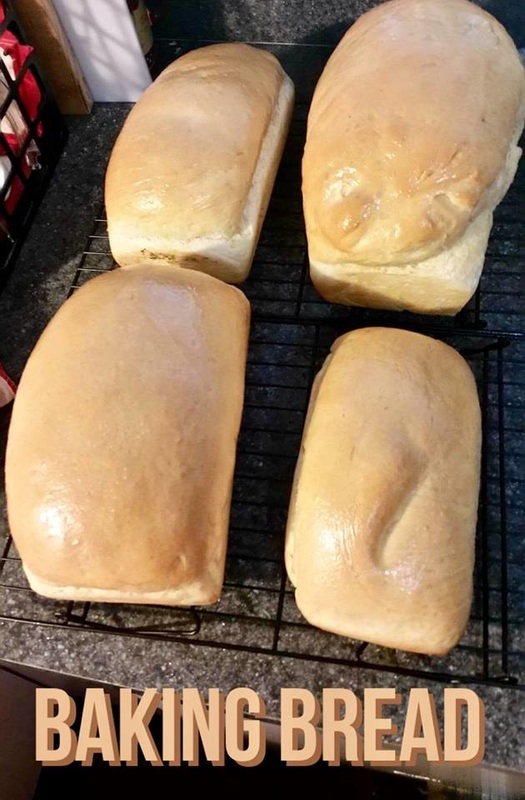 Immediately brush melted margarine over the hot tops of the loaves, and cover with a towel that has been run under the hot water tap and wrung out really well. This helps to keep the crust of the bread soft. There you have it. This made 4 loaves. As you can see from the photos, I still have a hard time getting the loves to be uniform in size. It doesn't matter, a thickly cut piece of warm from the oven bread slathered in margarine is a great, and welcoming snack!